If you're on instagram you might have seen a beautiful looking gold eclair floating around and wondered to yourself if it's even real! Tired of corner shop cake, I decided I would brave the rough streets of Highbury and Islington. My destination : The French Patisserie that is Belle Epoque. Belle Epoque is easy to get to. Turn right when exiting the station, walk for about 5 minutes and the patisserie is across the road. The area itself is a bit grubby. I wouldn't choose to come to this branch of Belle Epoque for a sit down visit. Which is a shame, because the patisserie itself is the complete opposite. Belle Epoque is typically Parisian, with a sleek monochrome colour theme. There are a few stools and tables against the wall. Plus two outdoor tables. The sweet treats in the shop window at Belle Epoque look so luxurious. Delicate, shiny, pretty things. All perfectly positioned. The friendly staff member was a native French woman. 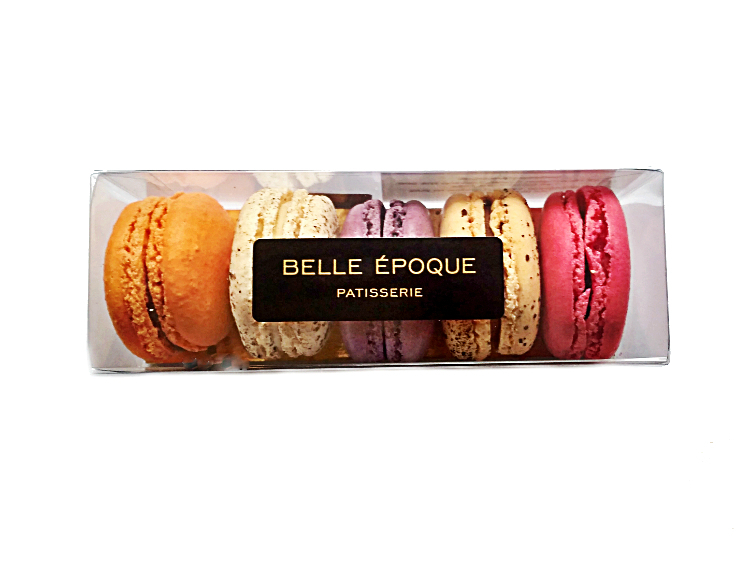 She explained the flavours of the current Belle Epoque eclair collection to me, and I didn't hesitate to order one of each - Plus a box of Belle Epoque macarons for extra good luck. Now for the big reveal..
Feast your eyes upon these beauties. The pink Belle Epoque eclair is raspberry and lychee flavour. It's supposed to taste like rose. The white discs on top are a smooth, milky white chocolate. The shiny pink icing is quite thin and not very memorable in terms of taste. The filling is fruity, with a mild sharpness. I couldn't make out the rose or lychee though. The green Belle Epoque eclair is apple and ginger flavour. The real pieces of ginger on top aren't too overpowering. The green fondant topping tastes a little powdery and not very flavoursome. The filling is a mild apple puree, and the flowers on top are smooth, milky white chocolate. I got a bit ahead of myself buying this eclair to be honest, as I already knew it wouldn't be a taste preference of mine. 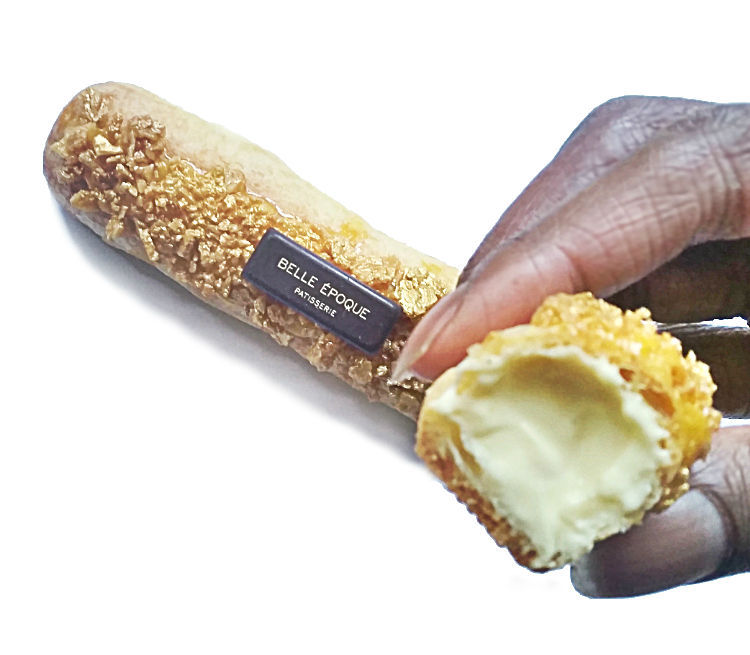 The gold Belle Epoque eclair is filled with a smooth vanilla creme brulee. You can see black vanilla specks, which is a good sign. The topping is a lovely crisp nougatine. Not too hard. Overall this eclair has a mild taste. It's mildly sweet, and there's a slight tang to it. The dark chocolate logo on top is smooth and creamy. Now for the Belle Epoque macarons. 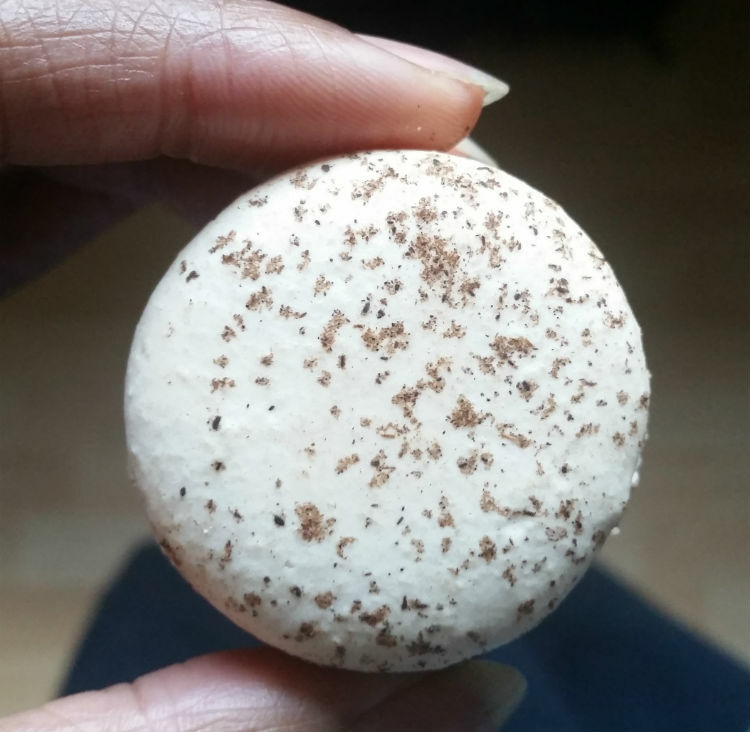 This was my first taste of macarons, and I must say they're pretty good. I've always expected macarons to be too sweet and hard, but thankfully they're not! These taste a little bit like meringues, which just so happen to be one of my favourite treats. I bought a pack of 5 in assorted flavours. Chocolate is by far the best, but maybe I'm being biased - as I am a chocoholic! They're so light, with a delicate crunch and a smooth creamy center. I'd probably only go back to Belle Epoque to try their fruit danishes and a unique hybrid - danish crumbles! Might have to ring ahead beforehand though, to check that they have them in stock. There were none when I arrived at Belle Epoque and I was there in the morning. Sobs. Appearances really can be deceptive, as the eclairs didn't taste as good as they looked. They weren't memorable or moreish. A little too mild and not chocolatey enough. 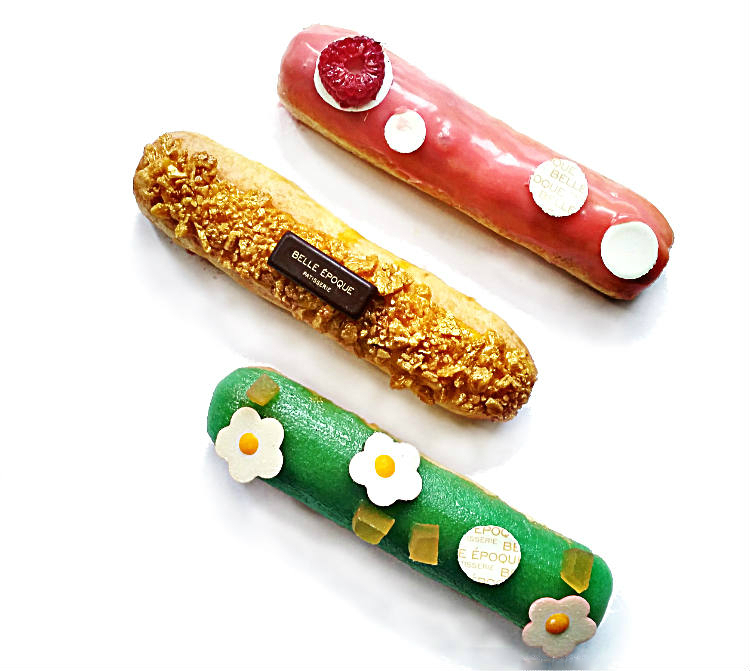 However, if you like your sweet things a bit less sweet, and you're into fruity treats then you'll probably love Belle Epoque eclairs. As for me though, you can gimme an original chocolate eclair any day. Found this review of Belle Epoque patisserie useful? The photos of food in this blog post are originals, which were taken of food from Belle Epoque Patisserie London. Along with any text and personal opinions about Belle Epoque patisserie and menu are copywritten by the owner of www.bestafternoonteainlondon.co.uk The photographs and text on this blog must not be copied. Distributed. Sold or printed without prior written consent of this travel and lifestyle blog owner. contact the site owner for more details.